Mozart's piano sonatas are among the most familiar of his works and stand alongside those of Haydn and Beethoven as staples of the pianist's repertoire. 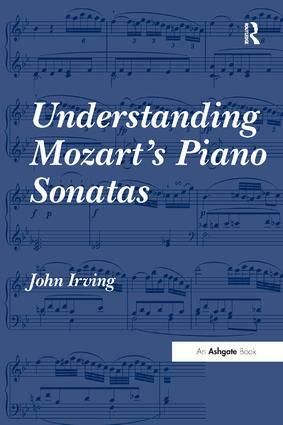 In this study, John Irving looks at a wide selection of contextual situations for Mozart's sonatas, focusing on the variety of ways in which they assume identities and achieve meanings. In particular, the book seeks to establish the provisionality of the sonatas' notated texts, suggesting that the texts are not so much identifiers as possibilities and that their identity resides in the usage. Close attention is paid to reception matters, analytical approaches, organology, the role of autograph manuscripts, early editions and editors, and aspects of historical performance practice - all of which go beyond the texts in opening windows onto Mozart's sonatas. Treating the sonatas collectively as a repertoire, rather than as individual works, the book surveys broad thematic issues such as the role of historical writing about music in defining a generic space for Mozart's sonatas, their construction within pedagogical traditions, the significance of sound as opposed to sight in these works (and in particular their sound on fortepianos of the later eighteenth-century) , and the creative role of the performer in their representation beyond the frame of the text. Drawing together and synthesizing this wealth of material, Irving provides an invaluable reference source for those already familiar with this repertoire. Contents: Preface; Pretexts; Part I Reading Texts: Contexts; Horizons of understanding; Editions; Approaching the texts. Part II Playing Texts: Instruments; Embellishing Mozart's texts; Epilogue: listening to texts; Bibliography; Index. John Irving is Reader in Historical Performance at Trinity Laban Conservatoire of Music and Dance. He was previously Professor of Music at Canterbury Christ Church University, Director of The Institute of Musical Research, School of Advanced Study, University of London, and Professor of Music History and Performance Practice at The University of Bristol. His five books on Mozart include studies of the solo keyboard music, string quartets and piano concertos. He is also a fortepianist, performing and recording both on historic keyboards and modern copies.